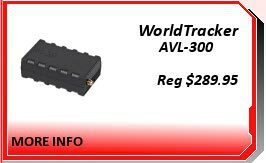 The WorldTracker AVL-300 (Automatic Vehicle Location) is a new alternative to the popular AVL system, featuring a rugged self-contained durable case that allows for outstanding protection when installed in harsher locations. 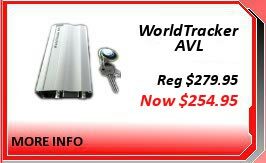 The -300 'multiple use AVL tracker' has many of the same features as the traditional AVL, compromised for a redesigned high strength case with no external dual antennas. The unit hard wires directly into a vehicles existing power system and will function for as long as the vehicle does. 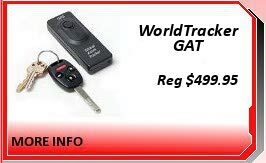 This is a tracking system that can be used both for commercial and personal uses, supporting the latest Garmin Fleet Interface protocol with required adaptations. 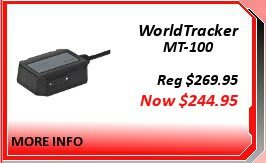 The WorldTracker AVL-300 provides real-time tracking information, with the added benefit of supporting installs in locations harmful to most sensitive electronics. With it's additional protective housing and smaller footprint, it is also perfect for unique applications such as marine use. It comes equipped with the latest UBlox chipset that virtually eliminates problems caused by GPS jamming devices. The 300 also has an updated 3D movement sensor and numerous digital and anolog inputs/outputs for monitoring various vehicle sensors as well as providing remote ignition control! We offer three service plans ranging from 3 months to a full year for 24/7 access to your tracking account. 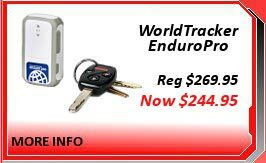 You can find it's location from anywhere with internet access, setup geofencing that will email and text you if the unit enters or exits a location, track movement patterns, speed, and more. No need for contracts with hidden fees or exit clauses and we will setup repayment the way you want! + A one time setup fee of $49.95 per unit. 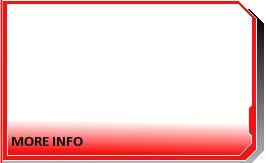 To Place an order, please contact us directly.